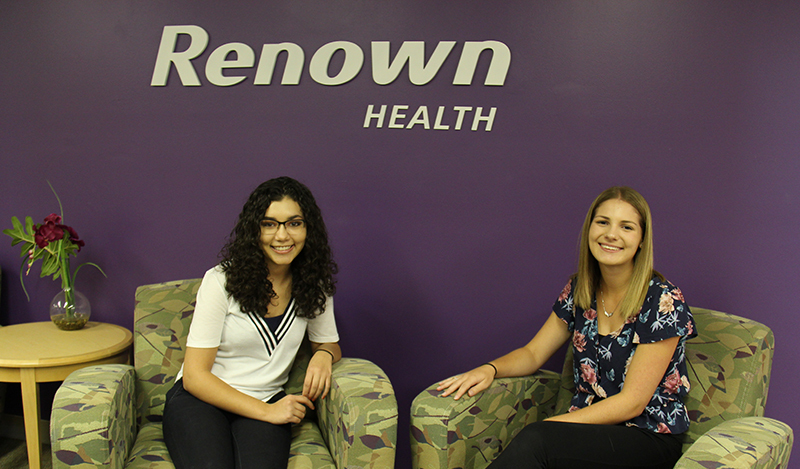 The Washoe County School District has partnered with Renown to create and pursue an internship program, in which high school students within our community are able to gain exposure and firsthand experience within their particular field of interest. Though Renown is a health network, it offers a diverse field of careers and passions that all coincide with the Renown setting. Ranging from medical to fine arts, this internship program offers so much to a variety of people and their interests. Renown is so much more than stethoscopes and syringes. Renown is a diverse community of varying interests and occupations. It is because of this that the Renown Internship Program is so successful with what it offers and teaches. The close to 30 students in the program this year are eager and excited to learn and grow throughout the course of the semester. They will need 45 hours of on-site service and are already tackling their hours and having fun in the process. Through projects and collaborations, these students are able to establish relationships and dabble in a professional environment. This experience allows for students to better evaluate their career choice and gain insight into what tasks their career consists of. An internship also allows for a student to experience and witness a passion and interest of theirs, without the mandated use of textbooks and algorithms. Instead, an internship offers exposure to the reality of the working world — how it functions, its complexities and its adaptability to the ever-changing workforce. An internship allows for a bond between intern and occupation.